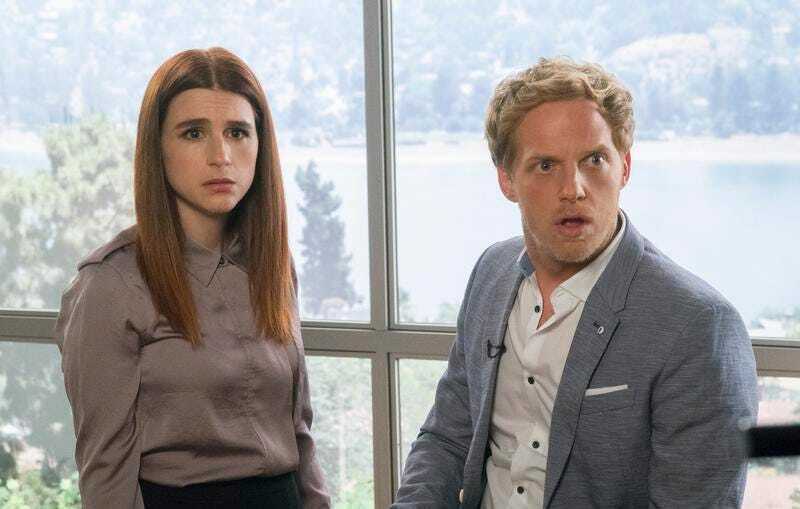 Last week, I expressed some doubts about the decision to keep Jimmy and Gretchen apart during this season of You’re The Worst. I wondered about the sustainability of that approach over the course of an entire season, using “This Is Just Marketing” as a model for what the series’ future might look like. Though I don’t think “This Is Just Marketing” was the show at the top of its game, precisely because it separated the ensemble, I’ll admit that my worries might have been a bit premature. This week’s quasi-bottle episode “Fog Of War, Bro,” written by Eva Anderson and directed by Stephen Falk, tightens up the action considerably, even if it’s just by limiting the locations to Jimmy’s house and Lindsay’s apartment. Most importantly, it brings Jimmy and Gretchen together again, not so they can earnestly address their relationship status, but so they can avoid each other, and for Gretchen to wage a passive war of attrition. In this episode, Anderson and Falk successfully adapt their established dynamic: Gretchen, fueled by fury and betrayal, now dominates Jimmy’s mind and space, and Jimmy, paralyzed by guilt and fear, has become a stranger in his own home. “Fog Of War, Bro” follows Jimmy on the day of his People Magazine profile, which he assumes will be written and will take place far away from his home but instead is an on-camera interview in his living room. Worried that Gretchen will sabotage the interview, he futilely tries to get her to either leave or not cause any incidents, but a frighteningly detached Gretchen has Jimmy in her sights and won’t let him off the hook. At first, she starts small by stealing his food and nailing a curtain to his bedroom wall, but when the camera crew arrives, she pushes his box spring out of his window onto his lemon tree. She’s adopts a completely unhinged persona (described by Edgar as “We Need To Talk About Kevin weird” or, alternatively, “like a Japanese ghost”) to make sure Jimmy squirms as much as possible. Anderson ratchets up the claustrophobic tension in Jimmy’s house in every scene, either by adding more plot incidents or visual gags, like Aya Cash in Ringu cosplay to freak Edgar out. After Gretchen takes her swipes, Jimmy strikes back by threatening to expose her whereabouts to Sam and Shitstain, who both still believe she’s in Europe. Though they agree to a temporary détente, Jimmy accidentally texts the two of them anyway when he meant to delete it off his phone, leading to a confrontation between Gretchen and the boys. Unfortunately for Jimmy, Gretchen confesses the truth about what has happened for the past three months, which places Sam and Shitstain firmly on her side. Their performative embraces in front of Jimmy during his interview are like daggers in the chest, and Jimmy’s terrified expression all but confirms that. While Anderson’s script for “The Fog Of War, Bro” treats the episode’s action like a Jenga tower threatening to tip over, Falk’s direction provides it with wonderful support. Since the episode limits the locations to two sets, it gives Falk a nice showcase for his talents behind the camera. He captures both the breadth of Jimmy’s house and how that contributes to its stifling nature. Unlike, say, “There Is Not Currently A Problem,” which mostly takes place in Jimmy’s living room, Falk tracks around the house this time, illustrating the various corners where Jimmy and Gretchen take refuge from the other. Aided by an especially jaunty score, Falk frequently shoots his characters either in close-up or off-center shots that feature the set in the background, to demonstrate how their fractured states reflect upon their environments. Falk highlights windows during Jimmy and Edgar’s meeting in the kitchen, eerily foreshadowing Gretchen’s disposal of Jimmy’s bed; during Lindsay’s call to Gretchen, he cuts between Gretchen’s expressively manipulative face and Lindsay’s apartment in deep focus, visually juxtaposing Gretchen’s new plan with the emptiness of Lindsay’s life without her; Falk’s montage of Edgar and Lindsay freaking out features quick cuts at different angles to communicate an anxiety spiral. Falk handles every shot with care, which only enhances the potency of Anderson’s script. But in the last few moments, Geere and Cash take center stage as Gretchen fakes out Jimmy with a possible reconciliation. When Gretchen crashes Jimmy’s interview, it seems like she tries to tank it by showing off their engagement, which would go against the approved narrative of Jimmy as an erotica-writing bachelor, but it turns out that Gretchen actually wants to discuss their relationship. Jimmy believes Gretchen to be sincere about wanting to stay and actually convinces his publicist and the interviewer of a new narrative. Geere conveys a flurry of internalized emotions as Gretchen plays at genuine candor, but the two that surface most readily are relief and shame. Jimmy clearly wants Gretchen back in his life but doesn’t know how to properly atone for his actions or if it’s even possible for him to do so. Neither Jimmy nor Gretchen is the best at open communication, and since both are now on the defensive, it’s even harder for them to know what the other actually wants. Jimmy would rather play it by ear than actually demand anything, which leads him into trap after trap. Gretchen, on the other hand, is out for blood. She’s shed her victimhood status and now plans to take back what’s hers, especially after Jimmy accidentally reneged on their deal to keep their professional and personal lives separate. After lulling Jimmy into a false sense of security, she shoves a hook-up with Boone in his face and then proceeds to sleep with him in his bedroom. It’s an ugly situation and one that shows no signs of improving. The only thing that doesn’t really work in the episode is Lindsay and Edgar’s mini B-plot. The whole idea that they would freak out because they’re now “in charge” feels pretty warmed over, not to mention their “plan” to reunite Jimmy and Gretchen. The song was nice, though. According to the episode, People Magazine has pivoted to video and their new streaming service is called Where The Magic Happens, which is a startlingly accurate depiction of the current media landscape. Funniest sight-gag of the episode is Edgar jumping off the balcony, mostly because Falk doesn’t move the camera allowing it to occur in the background. New information about the still-absent HoneyNutz: He’s 45 years old. The truth came out when he was freestyling about how the Challenger explosion really messed him up.